In today’s markets, you can get a huge variety of readymade specialties. 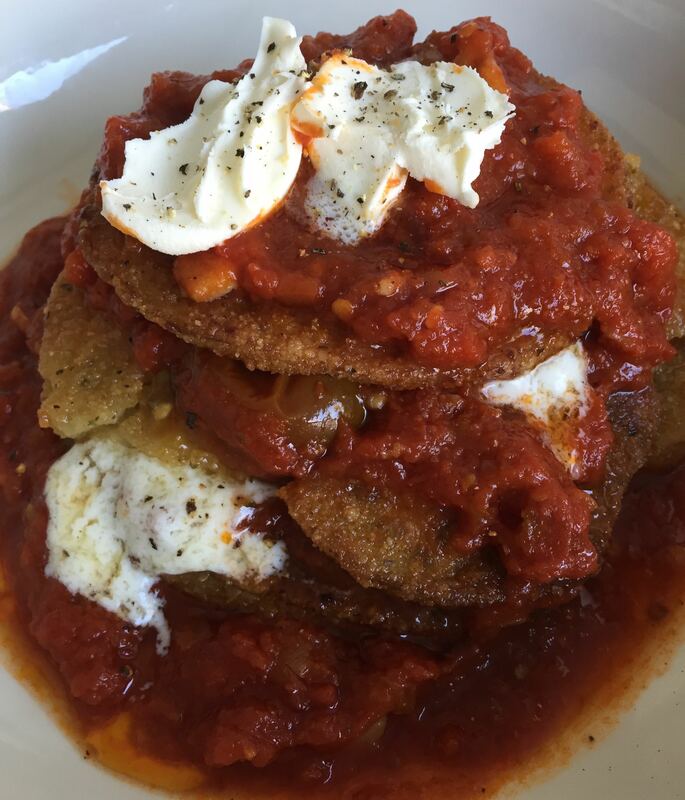 My newest discovery is pre made eggplant cutlets from Trader Joe’s. Wow! Life is good and dinner is amazing!! In this recipe I skipped making it into a casserole, instead I created the fast, easy, delicious tower. Line up cutlets on baking sheet and bake according to directions on box. Repeat until your tower evolves. In a medium size pot heat oil, saute garlic and red pepper. Add the tomatoes, basil, salt and pepper. Cook uncovered for 20-25 minutes. 4 strips bacon-chopped into 1” pieces -I like thick cut bacon for this recipe. In a medium frying pan on medium heat, heat the olive oil. Add shallots and cook for 5 minutes. Add bacon, Cook for 10 minutes. Add garlic and chile and stir. Tomatoes, Parsley, Salt, and BlackPepper. Stir together. As the tomatoes release their juices scrape any brown bits off the bottom of the pan. Cook for 20-30 minutes on low heat.